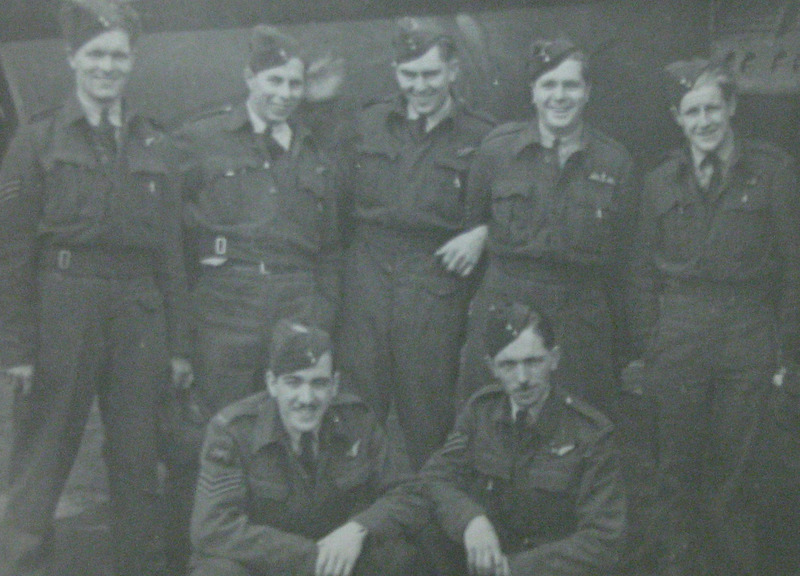 Ken Earnshaw, back row, third from left, in his 50 Squadron crew. Back, L-R: W Mooney, J W Fraser, K Earnshaw, N L Schofield, B Jagger. Front, L-R: J O Christie, R A Baker. Kenneth Earnshaw was born in Bridlington, Yorkshire, on 23 June 1918, the son of Joseph and Janet Earnshaw. His family emigrated to Canada a year later and took up farming in rural Alberta. He was educated at Camrose High School. He qualified as a teacher at Alberta Normal School in Edmonton, and then taught at Whitebush School in Bashaw, Alberta, before leaving to enlist in the RCAF. He married Mary Heather in November 1941, and they lived in Bashaw. After training in Canada, at the end of which he was commissioned, he travelled over to England, and was posted to 50 Squadron in November 1942. He was part of a Lancaster crew which flew with pilot Norman Schofield; the crew’s bomb aimer, fellow Canadian John Fraser, became a close friend. Together they flew on 30 operations in under six months. Gunner Brian Jagger, who would fly on the Dams Raid with David Shannon in AJ-L, was also in this crew. By mid April 1943, they were scheduled to go to a training unit for the normal inter-tour rest period. However both Earnshaw and Fraser were recommended when a call came from the new 617 Squadron being set up at Scampton. Pilot John Hopgood needed two new crew members. His first navigator had fallen ill and his bomb aimer had not come up to scratch. Earnshaw and Fraser were recommended and arrived at Scampton at the end of April, some time after training for the Dams Raid had begun. As navigator, Ken Earnshaw sat immediately behind John Hopgood and Charles Brennan in the cockpit. He must have seen the trouble Hopgood was in, hit by flak before they even reached the Möhne Dam. He had little chance of reaching the escape hatch when Hopgood ordered the crew to bale out, and he died when AJ-M crashed in a field near Ostönnen, 6km from the dam. Hopgood, Brennan, Earnshaw and Gregory’s bodies were found in the wreckage. Kenneth Earnshaw is buried in Rheinberg War Cemetery. Further information about Ken Earnshaw and the other 132 men who flew on the Dams Raid can be found in my book The Complete Dambusters, published by History Press in 2018. I think the caption on the photo is incorrect. B. Jagger is actually extreme right on the rear row. Any news on Ken Earnshaw’s log book ? .A think a new campaign to try and get it back to the family along with Yeo’s and Fraser’s should be publicised in the hope that someone comes forward and hands them in , this could be anonymous.